You see, Scotland did something downright mean this year. It offered us an April beyond compare; the birds were singing at full volume, the trees were blossoming weeks ahead of schedule, and day after day dawned sunny, bright and warm. “This global warming thing isn’t so bad after all!” was a refrain heard round the city, as the promise of a long, dry summer began to take shape in our imaginations. You know, the kind of summer everyone else gets every year. But then May arrived, and with it freezing rain, howling winds, and hailstorms. We turned our heater back on after more than a month of disuse. We switched back to the winter quilt. And worst of all, the shelves full of the season’s first produce were suddenly the last thing I wanted to eat. I mean, I wanted to want to eat them. I certainly have been looking with envy at all those beautiful strawberries and early-season cherries, plump baby favas, purple artichokes and white asparagus splashed across the blogosphere. I should be eating that stuff too, I told myself wistfully, even if it has been imported from Turkey or Sudan or wherever they grow these things nowadays for the Scottish market. But when I actually went shopping, it became clear that all the good intentions in the world couldn’t change the impact the weather was having on my appetite: all I really wanted to eat were potatoes and pasta, sausages and stews and crispy-skinned roast chickens. And chickpeas, so many chickpeas. Yes, sometime during this miserable month of May, I began bringing home two, three, four, six cans of chickpeas a week in an attempt to satisfy my sudden and inexplicable cravings for them. In fact, I’m beginning to wonder if they’re slipping some addictive anti-depressant drugs into the lining of those cans. I’ve been forcibly restricting myself to making Ximena’s chickpeas with spinach only once a week (try it with feta, mmmm! ), and we’ve tried just about every variation we can dream up of a simple chickpea salad à la Molly. Then there’s hummus, which I’ve been eating like it’s going out of style, and I even experimented with a hot cream of chickpea soup flavored with sherry (which, admittedly, was the one dud in a sea of chickpea bliss). But nothing, nothing compares to these chickpeas from Catalonia, the recipe for which I found in what might be my new favorite cookbook. I’m almost at a loss to describe them, they’re so good; imagine the heady saffron-and-garlic pungency of a great paella blended with the nutty sweetness of romesco, but instead of finding rice or seafood lurking under all those explosive flavors you find chickpeas, soft as butter. This is a dish that hits all the right notes of versatility too; it’s a bold and intriguing side dish as part of an elaborate meal, and it’s also at home as the main event, with nothing but a piece of bread and a crunchy salad to help it down; it’s even fantastic cold (which, let’s face it, is probably more appealing to you right now than to me). Anyway, I’m doing my best to stay optimistic that the long, hot summer of our dreams is still on its way, and should you wish to cross your fingers for us I’d be much obliged. On second thought, though, a shipment of any spare sweaters and wool socks you have lying around would probably be a better idea. And while you’re at it, throw in some extra cans of chickpeas, just in case. This wonderful dish comes from an equally wonderful cookbook that in my ever-humble opinion deserves to be far better known than it is. The Essential Mediterranean by Nancy Harmon Jenkins (a regular contributor to Food and Wine and the New York Times as well as a part-time resident in Italy) is easily one of the best cookbooks of its genre I’ve ever come across. While there are many books about regional cuisines that are fascinating reads yet are only mediocre books to cook from, and many more that are the reverse, few manage to be both simultaneously. This one is; its chapters on the basic foodstuffs common to the entire Mediterranean – olives, wine, wheat, salt, etc – are an eloquent weaving of history, travelogue, and memoir, followed by a selection of intriguing and well-researched recipes that illustrate the different ways the ingredients are used across the region. This is one book I find dangerous to keep on the bedside table, since once I pick it up to read I simply can’t put it down! Oh, and as for this recipe, try it with some spinach or other greens – blanched and coarsely chopped – stirred in with the stock and almond mixture for a slightly different take on a satisfying one-bowl meal. Try the chickpeas – if they’re not completely soft to the bite (and canned ones rarely are), bring them to a boil in lightly-salted water and cook them until they are, usually about 10-20 minutes. Drain. In a heavy frying pan, heat the oil over medium-low heat and sauté the onion until it is golden brown and very soft, about 25 minutes. Add the chopped tomatoes and sugar, letting them fry until they melt into the onions and form a paste, about another 10-15 minutes. This is called a sofregit, and its intense flavor forms the basis of many Catalan dishes. Remove the pan from the heat. In a large mortar or food processor, combine the saffron, garlic, almonds and parsley and pound (or pulse) to a thick paste (add a little water if necessary to keep things moving). Add the paste to the onion mixture along with the stock and the chickpeas, bring to a boil over medium-high heat and simmer until the liquid has reduced to a thick sauce, about 10-15 minutes. Season with salt and lemon juice to taste. Serve hot or at room temperature; you’ll find that this dish keeps developing in flavor the longer it sits. I happened to be in Edinburgh during your beautiful April…and it was sure a far site better than the miserable end we are having to May!Love the recipe. Can completely understand the obesession with chickpeas…I did that once…think I still have some extra cans lying around. I just re-read the recipe – do you add the sauce to the chickpeas at the end, or should they be cooked together for a bit too? Oana – Oops, good catch! I’ve corrected the recipe – the chickpeas should be added to the pan at the same time as the stock. This looks delicious, Melissa. I can completely understand a chickpea obsession. I’ve been having a intense and intimate relationship with beans this spring. As for the weather, oy. I’m in SF this week and it is cold and foggy–mittens and scarves kind of cold and foggy. Doesn’t help that it was 85 degrees in Seattle recently.Hang in there, if there’s any justice (which there may not be in the weather world) you’ll get your summer. At least I hope you do. Looks fantastic, can’t wait to make it soon! Love love love your blog — and that cauliflower risotto with spicy pangrattato has become one of my all time favorites! Here’s hoping your weather improves soon! Melissa, I am a bit tickled to hear that you have been addicted to chickpeas. Im not sure why, maybe Im imagining you carrying all those cans home, or moving your truffle oils and christine ferber jams aside to make way in your cupboards for them. Truth be told, I keep a regular supply of at least 6 cans in my cupboard at any one time, so I am a big fan too. And I am always happy to find a new recipe–this one looks great and like Molly I’ll be giving it a try asap! First off, I love your blog and have tried several of your recipes. All of them have been extraordinarily good. Especially the fideua and the far breton.I also love The Essential Mediterranean and every recipe that I have tried from it has also been extraordinarily good. Thanks for what you do. Hi,If you live in Edinburgh and love chickpeas then you must try the jars of Spanish chickpeas they sell in I.J. Mellis – they’re amazing. I was thrilled to find someone who loves chickpeas as much as I do. My family just doesn’t understand. We’re having an unusual cold autumn down here so this recipe is fantastic!! and at least for a while I won`t be sad about living in "opposite seasons"… thanks!! Culinary Cowgirl – You know, during that beautiful April weather we were all joking to each other that this might be the only summer we got, so we better enjoy it while it lasted. I don’t think anyone actually believed that, though…!Oana – Smart move, heading down to Barcelona for a while. I’m on the brink of handing in my resignation at work and moving anywhere the sun is shining!Tea – Ah yes, those infamous San Francisco summers. That’s one thing you won’t miss in Seattle! 😉 Come to think of it, I suppose the ideal arrangement would be a summer house in the latter and a winter house in the former, no? I mean, assuming you can’t afford to live on some tropical island where the sun shines year-round… sigh.Emily – Music to my ears. Thank you!Stephanie – Hang in there! You sound just like me a few short months ago. I ate plenty of chickpeas too during those stressful writeup months, and well, they seemed to have done the trick. :)Molly – I should have known this recipe would be right up your alley. I look forward to your expert opinion later this week. ;)Michele – Um, think again about those jars of Christine Ferber jam. Sometime last year my ONE and ONLY source for them up and left Paris, leaving me with no choice but to return to the vastly-inferior supermarket stuff. Any ideas who that might be?Kat – Thank you, please keep those fingers crossed!Maria – For me it’s just a matter of convenience. I find them roughly equal in terms of flavor and consistency to ones I’ve cooked myself, but the canned ones only take minutes to prepare. Maybe a contributing factor is that I also never remember to soak beans ahead of time… 🙂 p.s. So glad to hear that you love the olla gitana!Renee – So glad to hear it, thank you! I have dozens of recipes in The Essential Mediterranean bookmarked. Any in particular you highly recommend?Truffle – I’m so envious, you are going to eat SO well. I hope my suggestions aren’t too out of date by now – it’s been a while since we were there. Of course, if you stumble upon any gems, I’d love to hear about them!Ed – Great suggestion, it’s just around the corner from me. I’ll stop in tomorrow!Sheri – Hmm, it sounds to me like they just need to be convinced. It may not work, but at least you’ll get to cook a lot of chickpeas trying!Sil – You never have to be sad that you don’t have the weather here in Scotland, no matter what time of year. Trust me! And let me know if you like the chickpeas. :)Heather – Why not just leave out the almonds and see how it turns out? They’re an interesting textural and taste component but the dish by no means depends on them. You might want to reduce the amount of stock (by half a cup or so?) so it doesn’t end up overly soupy, but that’s the only other alteration I would make. Let me know! wow! the recipe sounds delicious! I will have to try it one of these days. I’ll let you know how it goes! Btw, you’ve got a really beautiful blog. I love the design. Hi, yummyyy i have made this dish for lunch and it’s delicious! i have made some small changes though, I added a very small dash of cumin, and a little paprika. i’ll write a post about it! cheers! this looks so good! i’ve been trying to think of something new to do with chickpeas. thanks for the recipe. do you have a catalan cookbook recommendation by any chance? oh, yes, that seems to be the definitive chickpea recipe. hands down. can´t wait to try it, because yes, I think there must be something in the little garbanzos. I can´t stop eating them either. Hi Melissa! Love this recipe (especially with the greens). i’m going to try it this weekend in sweet overcast and cold Aptos-by-the-sea, Calif. I also just ordered Jenkins’ book and look forward to cooking from it. Have a great weekend! This smells wonderful. I know this, because I am making it right now, with a watchful eye on the tomatoes and onions, and the garlic /almond paste in the mortar, ready to go. The plan is to have it for a solo supper tonight with my first (mostly lettuces) CSA salad of the summer, then take it for lunch on several days. There may be some retraint problems involved in keeping to my plan, I fear. thanks for this recipe – i like chickpeas but don’t eat them nearly enough… and seeing that it’s far too cold out for june, comforting pulses are the way to go! Thank you! I’ve made them again for a friend who noormally doesn’t like chickpeas (I didn’t know this when I made it:)), but this time she loved them! I made looooads and had it the next day as well. The best part was that while they were cooking a wonderful aromas of saffron, garlic, tomatoes and cumin were lingering around the house! hi Melissa!thanks for sharing the recipe!! I just made a batch..n they were sooooooo good!!!! I feel at peace with the world now…!! 😀 cheers! Ha! During university, I spent a year abroad studying at the University of Edinburgh. It is the best, most beautiful city in the world, but I did not take off my waterproof outdoorsy coat the entire year (and forget about using an umbrealla in that wind)! When I got back home, I told my mum that I needed a new jacket because I never wanted to see that one again. I made these chickpeas last night and they were incredible. This is the only blog I’ve ever commented on! Hi Melissa, just wanted to let you know that I found an excellent brand of canned chick peas at a local Asian supermarket – East End. They come soft out of the can, and are so tasty that I sometimes just snack on them, straight out of the can! Do try them! this looks amazing. i am also a chickpea junkie – this may be the fix i needed! I am Catalan, and whereas this recipe is not a classical "canon" one, it captures so well the essence of Catalan cooking… Will probably try to pass it as my own in the presence of older relatives 🙂 Lovely blog, by the way! Thanks so much, this recipe is fantastic. It’s nice to have a new recipe with saffron. I’ve rarely had it except in paella and with steamed mussels. I’m a lifelong vegetarian, and, as you can imagine, have eaten many chickpea dishes in my time. 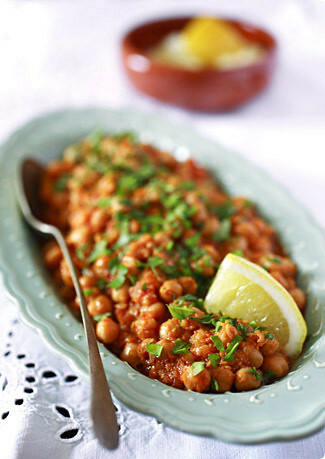 This recipe, however, is the most delicious chickpea dish that I’ve ever eaten – thank you! Thanks for the recipe! I've recently started cooking for myself in Morocco, and find the difference in ingredients tough… this used all ingredients I could find (without tasting like Moroccan food) and was delicious! Would've added a little more garlic, and tossed in some cumin and more salt than you suggested.